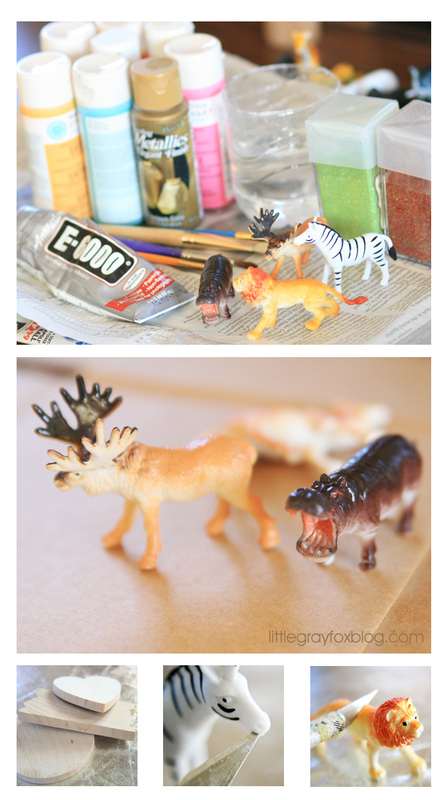 Crafting with dollar/thrift store plastic animals is one of the many new crafting trends. You can buy a lot of these finished crafts online. But if you've got some spare time, why not just make your own? 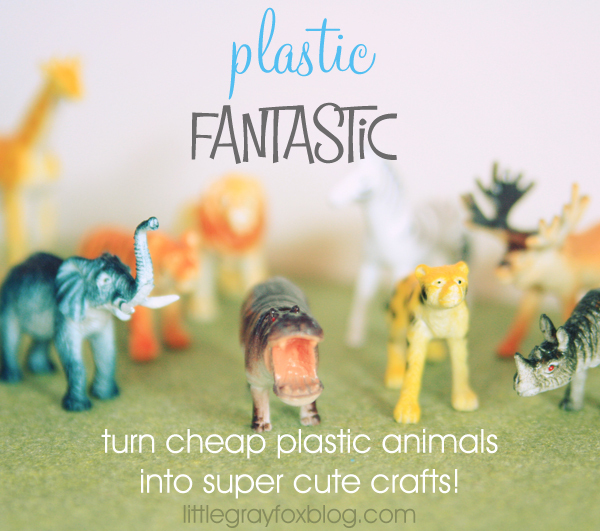 Google "plastic animal crafts" and you'll find a whole slew of tutorials. I decided to try a few on my own. I used small plastic figures but there are other crafts out there for using the larger ones. If you're going to do something such as bookends, you will probably want a larger, more sturdy toy. Pick out acrylic paints in whatever color you choose. I did a couple of neons, gold, white and black. I also grabbed some glitter. I am not so great with glitter, it pretty much got onto every animal! To make the place card holders use your exacto knife to carefully slice a line through your toy. For the zebra, I chose the mouth; for the lion, I cut in the middle of his back. Cut as deep as you want the cards to sit. Use your Dremel tool (or Exacto knife, but I promise that will take longer and your hand may get sore!) and slice the chosen animals in half. Be careful because the friction of the Dremel will cause the plastic to heat up quickly! Either clamp one end of the toy to your table or have someone carefully hold the toy down while you cut. Once they are cut arrange them on your plaques and decide how you want to decorate them. Start by painting the animals with a base of white for primer. Once dry, paint each animal with your choice of colors -- or if you're adventurous, try some glitter! That picture above is my poor hippo drowning in glitter! You may want to use a couple of coats depending on how well the white covers the original color. Once all paint is dry, coat with some Mod Podge Hard Coat for a glossy shine. 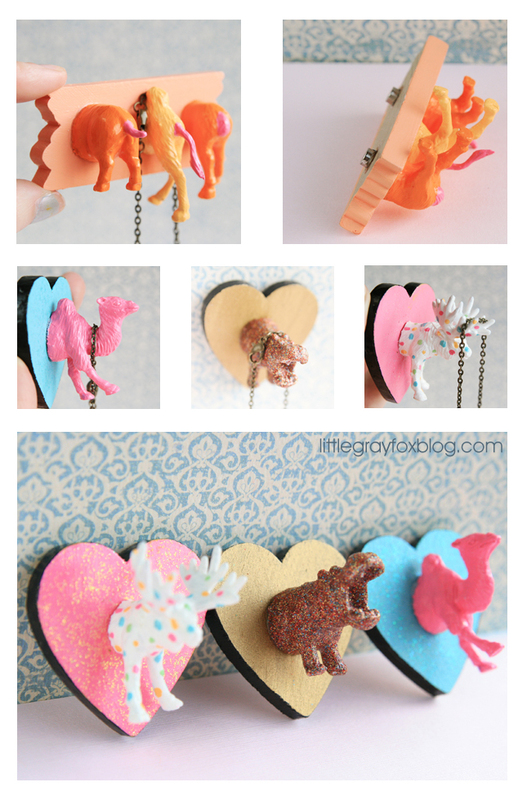 Also, paint your wooden plaques/hearts being used to mount the animals. 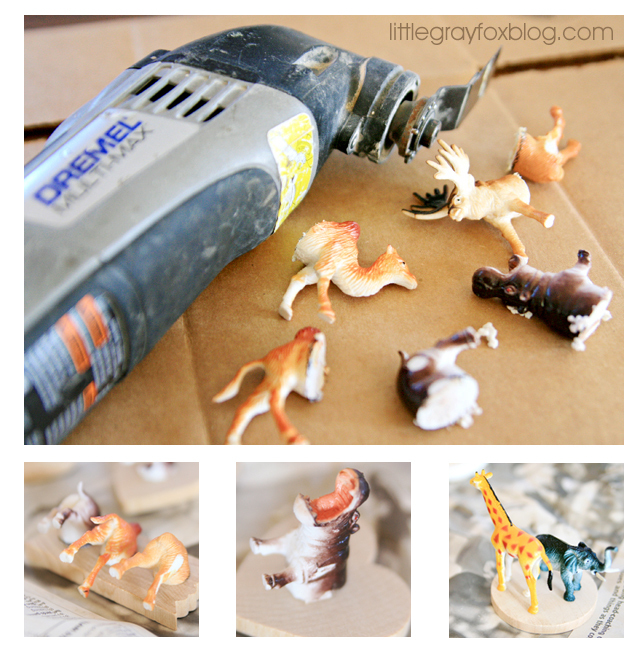 Once everything has dried, use your E6000 or hot glue gun to attach the animals to their base. Glue the magnets onto the back or use a picture frame hanger if you want to be able to mount it onto a wall. 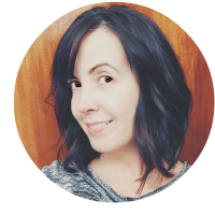 Go crazy with colors -- my favorites are the polka dots! I WANT A POLKA DOT MOOSE! ok well obviously i need to make all of the things. thanks! You can make a whole gaggle of polka dotted moose if you wanted! Do IT! I love them all, I know we have little plastic animals laying around. My favorite is the jewelry holders!!! Thank you! If you make some, you can come back and post a link to share! I'd love to see how they turn out! Thank you! :) The polka dots were definitely my favorite to make! Great idea! I want to make one to hang my necklaces and maybe my rings too! Thanks for sharing!! If you can find some plastic unicorn toys, that'd be pretty awesome, too! I love every one of these ideas! I must make them all! Thx for these ideas! I've used a half animal on a pictureframe (without the glass) and attached it to my boys closet door. It's his coatrack for his bathing wrap. But I'm gonna try some of yours too! These are wonderful! I especially love the ones used as necklace holders! 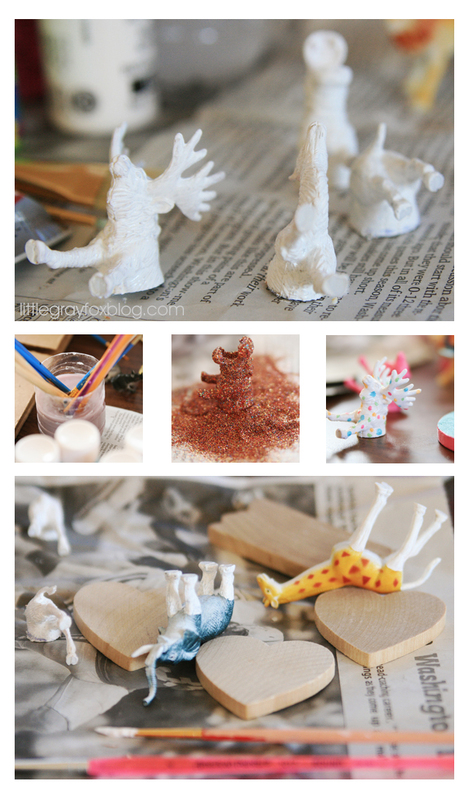 We love that you're reusing old toys to create new and useful items. We'll definitely try this one out! We love the idea of using reds, greys and mustard yellows as a colour scheme! Can't wait to try it out! We just love good ideas!Creativity and re-using is what this world needs now! Thank you for those wonderful ideas that give old things new useful life. We at 2nd Take are a green business and we fully support this idea. He encontrado tu blog tras los mundos de Momó y me alegro, me encanta! Me quedo y te sigo desde ya mismo.Pasate por el mio y si te gusta, quedate! this looks like a really cool craft project. 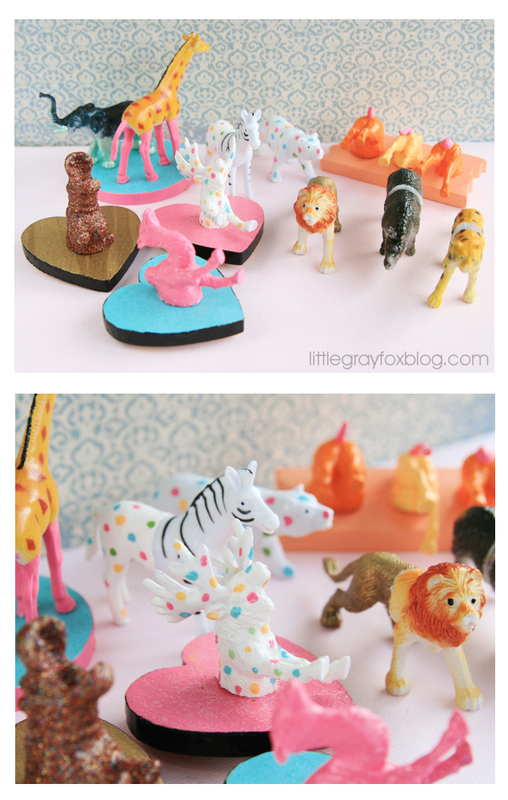 i found some plastic animals at my house too(being a mom of 5yr old and 18 month old) so i cut them like u showed. here's my problem all of them are hollow from the inside. how do i stick them to the wood now? These are awesome. So cute. I always like the Plastic Card Holders instead of other. Thanks for sharing. great post and nice collections.. This is so cute. Can I buy one? 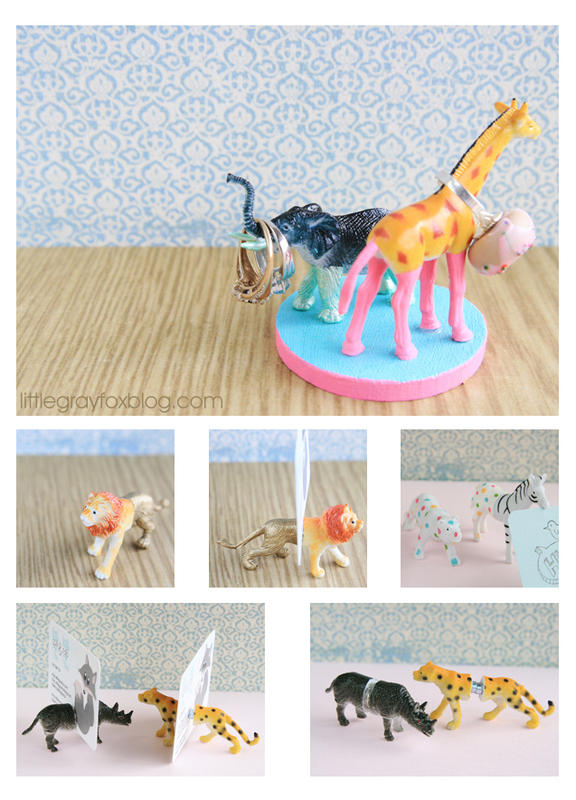 Awesome animal crafts DIY tutorial.